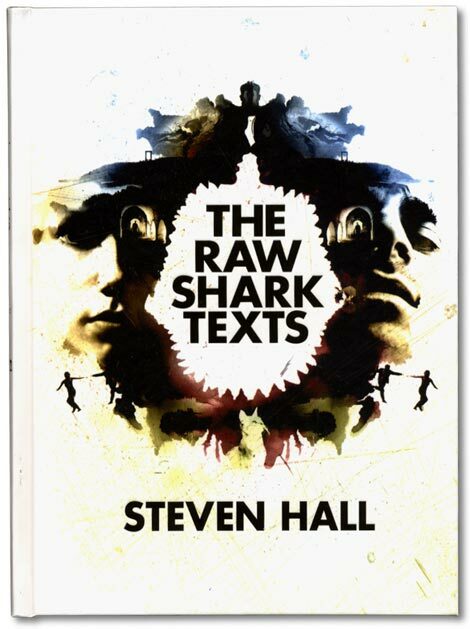 The Raw Shark Texts is an experimental idea of a story in book form. The raw ingredients encompass just about every sizzling modern experiment of a story that preceded it: a pinch of Fight Club, two sprigs of the Matrix finely chopped, three cupfuls of House of Leaves, a smattering of Cryptonomicon, a generous dose (at least 6oz) of Eternal Sunshine of the Spotless Mind infused with essence of Memento, all whirl-chopped in a blender, salted with textual decoration, baked in a easter-egg kiln and served up Ã la mode. What am I talking about? Well, I’m talking about a book that wants to be more than it is is, or more than you think it is, an ambitious Rorschach Test of a book that wants to discern something about its reader even as its reader discerns the truth (?) about it. We begin in media res. Our hero Eric Sanderson spends a few pages waking up; flutter-rolling, bang-rattling, and coughing coughing coughing. When he’s awake, he realizes he doesn’t know who he is. A cryptic note from ‘the First Eric Sanderson’ sets him off on a rollicking quest to find out his own identity, leading him deeper into the world of slipstream metaphor, where conceptual fish live in the tidal wash of informational flow, nibbling away at words, ideas, and in particular those old style letter-S’s that were written like this: âˆ«. The First Eric Sanderson was heavily involved in this world. He lost someone, and Eric Sanderson the Second spends most of the book trying to remember what the First one did to make everything go awry. Whatever it was, it loosed the grand-daddy of conceptual predators, the Ludovician shark. Ludovicians are territorial hunters, in that once they grab a piece of a person, they never let go. 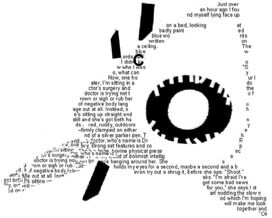 This means slowly, gradually, the concept of their prey is destroyed, their memories and memes are swallowed down, their personality torn apart and consumed, leaving us with the shell of a body with no person inside. This is how we meet Eric the Second, facing the same fate as the First. The story is wonderfully inventive, extrapolating from within its base idea a much wider world of conceptual creatures, warriors, organizations, and gestalt entities. We get explorations of unSpace, the wacky Dr. Fidorous, a shark flick-book, a love story, postcards from the past, codifications, and fun word-play. There’s a word for all this though, the text-images, easter eggs, colored lettering, odd fonts and so forth, and that word is: gimmick. But that’s a very cynical way to look at it. Was the Beatles- ‘Sgt Pepper’s’ concept album a gimmick? Of course it was, but that doesn’t mean it wasn’t great. There’s much to like in The Raw Shark Texts. The creation of this new world underlying our own is at once fascinating and a little disturbing. Whenever I put the book down I found myself wondering if I ought to set up some dictaphones around the room to create my own defensive ‘non-divergent conceptual loop’, or if I ought to whisper mantras of gibberish to hide my scent from the conceptual sharks. That whole side of it is delicious and delightful, and wholly original. The second thing is the character of Eric. In a lot of ways, he’s quite a wimp. He fights OK, and he gets by, and he defends himself alright. But when a woman is involved, he becomes a little needy. Numerous times he seeks confirmation that someone ‘really’ likes him, that things are ‘on the level’. He also spends quite a lot of time crying, about women both in the present and the past. And that is annoying. I don’t think it’s ‘being sensitive’, it’s just being a bit wet. It’s one area where being ‘a man’ is good for both men and women- you can’t always be sucking the re-assurance out of the other person, and Eric seems like a bit of a sucker. Neither of these are such big things though, and the quality of the world and the stories within it easily supersede them, leaving me eagerly awaiting Hall’s second book, the ‘intriguingly’ code-named ‘Hula-Hoop’. He says the architecture of the book helps to tell the story with this one even more than the Raw Shark Texts, so I’m holding out for a donut-book, to be read in a circular manner with a big hole in the middle. Go Canongate! See more on all this at Steven Hall’s website.